As we begin this new year of 2014, I am inspired to build the same type of mindfulness practice with my relationship with money. Finding the beauty in how money flows into my life, through this service that I am able to provide that supports others in mindful financial practices via socially responsible investing. Grateful for the abundance in my life that shows up in so many ways: through love, family, friendships, health, a warm coat and gloves in the winter, a reliable car, and on and on. Cultivating a way of living life that embraces such thoughts, I’ve begun to experience how important it is to have a “friendly” relationship with money. I’m taking steps to shift my relationship with money from one of shoulds and guilt and stresses to a relationship of gratitude, appreciation, and even joy. This shift is the result of simply taking time to develop a mindfulness practice around money in my life. Here’s an example: before I log into my bank account online, I now pause at my laptop, taking my fingers off of the keyboard and resting them in my lap. I breathe and smile. I set my intentions for this task I am about to engage in. I log in, and give thanks for the income and expenses as they are listed, reframing each line item to acknowledge the positive contributions that they make in my life: the warmth from our utilities, the hot water, a beloved home. I find joy in the transactions that have supported local businesses—and in the fact that I am a part of this wonderful community. I think of the nourishing food, the charitable donations, choices of how I contribute to my local community, and the ways my actions impact others across the earth. So much abundance is reflected in this list. Here’s another example: a familiar source of money stress for me is walking into a store and coming out spending more than I had planned to—then feeling the judgment and even hopelessness of having bought things I didn’t really need. I’ve learned to sit a moment in the car before I enter the store, and breathe. I get clear on my intention—why I’m going into the store today, and the ways my purchases will serve me and others. I also give myself an encouraging reminder of how it will feel when I leave the store, having stuck with my plan. Our financial lives are as sacred as the rest of our life actions. We just need to shift, to be reminded. We are stewards of the money that flows into our lives. Each dollar is an opportunity for us to express what we value and cherish. Each dollar is a tool for good, a tool for impact, a tool that is part of creating the world that we want now and the one that we desire for future generations. Please don’t get me wrong—I am not saying that we idolize money, obsess about it, put it above all else. I am acknowledging that we have gone too far in both directions, by both placing too much emphasis on money, and by stripping it of deeper meaning. What I am exploring is how to come back to a middle ground, a place where we bring awareness and sacred practice to our financial lives, engaging with our money as a conscious act. I am learning from and being inspired by other’s journeys, especially Lynn Twist’s wise book, The Soul of Money. She admits that “one of the most defining, demanding aspects of being engaged in the human experience is our struggle, our challenge, and our interactions with money.” She goes on to inspire readers that money “can be our greatest ally in our own transformation and the transformation of the world in which we live.” I have found that using the tool of money from a place of love, rather than fear, makes the difference in how it impacts me personally, and in how I live in the world. So where to start? Begin to develop an awareness of your current money stresses: notice how your body feels, and your self-talk (especially your self-talk; this is where it all begins). Then get clear on your intention. How do you want to feel and experience your money? Even if it doesn’t yet seem possible, what would like to experience? Choose one situation to start with and focus on that. 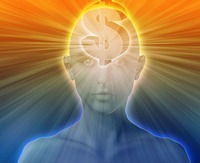 Now create three actions that you will do before, during, and/or after this money experience. If you are stumped, try breathing, smiling, and gratitude. These shifts, however small, will begin to move you toward a life of fewer financial stresses and welcome in a new feeling of financial joy and peace of mind.